America’s Instant Signs, a Signworld affilate that recently celebrated its 25th anniversary, completed a large sign project consisting of fabricating and installing 23 new or refurbished monument signs along with over 200 miscellaneous signs at 22 locations throughout 10 cities in Texas and Arkansas. Owner Linda Prina was awarded the project, while collaborating with a designer she had previously worked with, to help with the pricing structure and overall project management of this multi-faceted engagement. Each location required various signs: completely new monuments, refurbished monuments, and a variety of rigid signs. 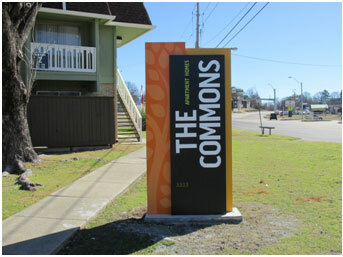 The new monument signs were fabricated aluminum cabinets with custom painted acrylic letters and accent decorations. 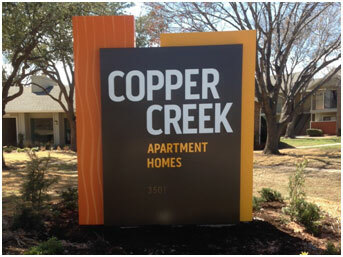 The refurbished signs utilized flat cut aluminum letters and custom painted acrylic letters. To finish out the project, the secondary rigid signs were generally aluminum with a digital decal and protective laminate. All of the monument fabrication and installation was outsourced to trusted manufacturing partners. 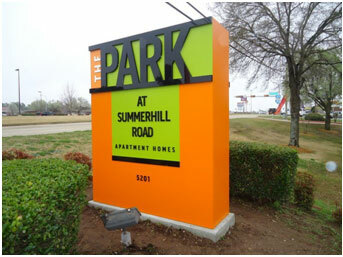 Linda used seven Texas sign companies for installation based on location within the state, two of which fabricated six of the monument signs, while a local Southern California fabricator manufactured the remaining 17 signs. 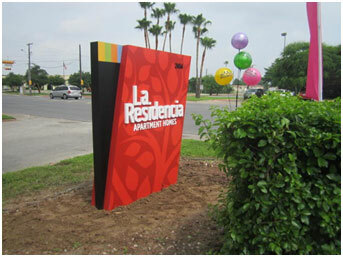 Linda was even able to use a fellow Signworld company, Texas Custom Signs, for some sign fabrication and installation. In addition, America’s Instant Signs produced 220 miscellaneous signs including pool signs, fitness center rules, and parking signs. Before any of the fabrication could even begin, Linda had to discuss with each property manager the specifics of location and placement of the signs. According to Linda, the most challenging aspect of the project, was to make sure that all elements would fit for the new and refurbished signs and to ensure that they were properly located as per city code requirements. All told, the entire project took 9 months to complete, which included surveying all 22 properties, permitting, production, and installation. The total cost of the project came to $445,000.